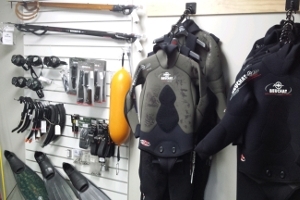 Our retail shop is packed with the latest products selling the largest range of SCUBA and Spearfishing equipment in the South Island. We can accommodate all budgets. Our staff are informed and will give you professional advise and service, so whether we are tailoring a package for you or selling you the ultimate dive system you will be treated to the same high level of service. 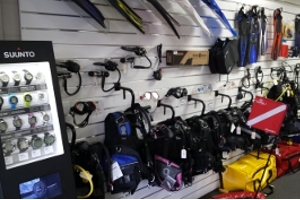 To back up our retail store we operate a full dive and ski service centre, PADI dive training to all levels, dive charters and tertiary courses up to a Diploma in Professional Dive Instruction. In September 2012 Dive HQ Christchurch was presented the PADI Outstanding Contribution to the Dive Industry award. Something that is not handed out often. Dive HQ and Ski World is now located (post 4/9/2010 earthquake) at 103 Durham St., Christchurch, which is South of the Railway line in Sydenham. You'll see the signage from the top of the Durham St overbridge as you head south from Moorhouse Ave. Click here to view Google Map of our location. Dive HQ encompasses some 40 years of diver training in Christchurch. More than two generations of South Islanders have been trained with us. South Island of New Zealand enjoys a temperate climate, which is moderated by the close proximity of the sea in all parts of the island and because of the unique phenomena created by the Main Alpine Divide. This enables both divers and snow skiers to carry out their recreation all on the same day and all within an hours drive from the city! The South Island of New Zealand is recognised as a major adventure playground with easy access through its international airport to summer and winter adventure activities on which Dive HQ and Ski World has based its business. All facets that the business caters for are available within approximately 1-2 hours drive. Local diving training is available within 20 minutes drive from the store at Banks Peninsula. Diving in the pristine and spectacular high country Lake Coleridge just 1.25 drive. Banks Peninsula > Akaroa, a quaint tourist village with unique French History and great diving / fishing / scenery / Hectors dolphin. (1 Hour). Methven > Internationally recognised Mt Hutt Ski-field, is credited with the longest opening field in the Southern Hemisphere and is 1.25 hrs drive from Christchurch. Porter Heights (features the longest ski run in the Southern Hemisphere) and the various ski fields of the Craigieburn range is the Canterbury ski and snow playground. Fiordland World Heritage National Park which is recognized in diving as having the Worlds largest colonies of Black Coral within easy diving depths (est. 7,000,000 colonies). Dive HQ and Ski World organizes charters to this wonderland. Picton > Marlborough Sounds> Picton is the home of the inter island ferry services so a natural departure point to the North Island if you are driving. The sounds feature diving, fishing, charter boats and an awesome water playground including the wreck of the Mikhail Lermontov 25,000 ton Russian Cruise Liner. This is a neat place for diving with practice wrecks - Kohi and Vara as well as the Fish Feeding in Double Bay and many locations for a succulent feed of hand picked scallops. Please leave your dredge at home! Do not overlook the opportunity to dive Long Island marine reserve and visit the historical Ship Cove, where Captain Cook visited so long ago. We can organise a charter for you in this area.